This week’s Featured Onepager does all the write things! 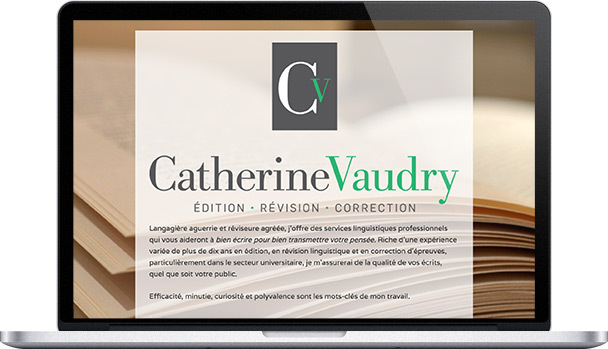 Catherine Vaudry is a freelance editor based in Quebec, Canada. Catherine uses elegant visuals and thoughtful design to keep the focus on her words. She smartly uses the colors from her logo in the page’s text, with the header text in green and the body text in dark gray. In addition to maintaining visual cohesion, the dark gray makes reading easier on the eyes while allowing it to still contrast with the white backdrop. The background image of a book adds visual intrigue that ties in thematically with her work, and she allows it to show through the white text area just enough without being distracting. Catherine also does a wonderful job of demonstrating her qualifications and skills. Her intro paragraph gives visitors a clear summary of her experience, which leads in nicely to the bullet-point list of her services. She then has a special section devoted to her academic expertise, and then goes on to list some quite impressive clients, followed by reviews from a few of them. So you don’t just have to take Catherine’s word for it—though you will certainly be happy to pay her for her help with your words after reading these. 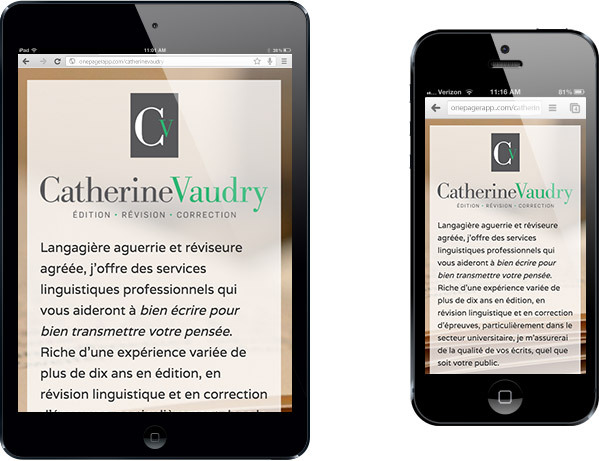 Congratulations, Catherine Vaudry, on a text-ellent site!